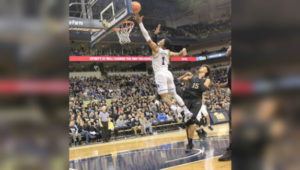 ( Pittsburgh, PA) The Pitt Panthers basketball team wore its sleek black uniforms and had Steelers WR JuJu Smith- Shuster and former Pitt WR Tyler Boyd in attendance for their home game against the 7th-ranked Duke Blue Devils. The Panthers had the hopes of hyping up a Petersen Events Center crowd to help them take advantage of an opportunity upset The Blue Devils. To be honest with you the black uniforms were an appropriate choice for the Panthers because this game looked like a funeral as they were slain by Duke by 35 points in front of a sold-out crowd, it’s first of the season. Duke Forward Marvin Bagley III led the onslaught with his 16 points as five Blue Devils scored in double-figures. As a team Duke shot 53.1% from the floor and Bagley also had a game-leading 15 rebounds. Pitt simply couldn’t find an answer for number 35 in white. Many persons felt like Pitt may have had a chance because Duke fell to unranked Boston College and NC State earlier this year, but let’s be real: Both the Eagles and the Wolfpack are far better teams than Pitt and will probably make the NCAA Tournament this year. The young Panthers looked like boys to the manly Dukes. 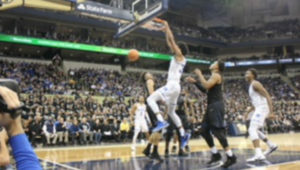 The Blue Devils flexed their muscles on Pitt from the tip-off as guard Gary Trent began the game with a 3-pointer which eventually led to a 10-0 lead before the Panthers scored their first basket. As the game went on, the Blue Devils lead increased proving that this game was truly a mismatch. 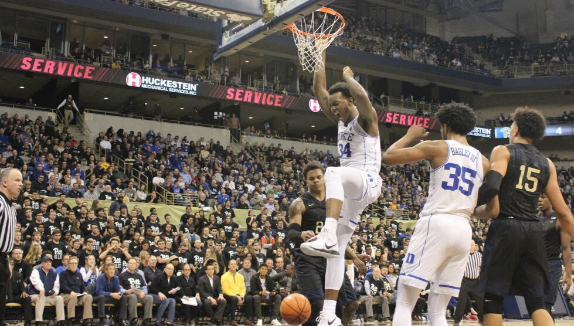 No matter what Pitt tried, it just wasn’t enough as the Blue Devils had leads of 20 and 28 points before the team from Durham enteres the locker room at the half up by the score of 50-24. In the second half, the Panthers tried their best as guard Jared Wilson-Frame and Parker Stewart did their best to help get Pitt to at least a respectable deficit, but Duke wouldn’t allow it as they continued to pour on the points as the score was eventually 79-45 with 3:36 left which sent many of the fans home and the Pitt reserves to finish out the game. Wilson-Frame led the Panthers with 17 points and Stewart had 10 as Pitt shot an abysmal 33.3% from the floor including connecting on only 4 of 22 shots from beyond the 3-point line ,while turning the ball over 15 times. The most impressive stat for the home team was their 32 rebounds. What’s really hurting Pitt is the absence of senior forward Ryan Luther who missed his 3rd straight game with a foot injury. Now the hard truth: that the Panthers had no chance in this game. They were outmatched, outmuscled and outplayed. Duke improved their record to 14-2 (2-2 ACC) while the Panthers fell to 8-9 and 0-4 in the ACC, their worst start since they moved from the Big East. 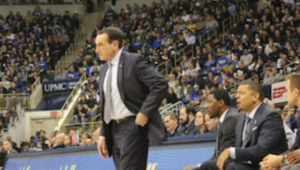 Mike Krzyzewski on Pitt’s current situation in hoops: “you all should stick with what’s going on. he’s a really good coach and a good guy. …. Kevin is trying to build a program, not a team.” And building programs take time, which is what it will require for this Pitt team to reach the kind of success that they’ve had in the recent past. The Panthers aren’t done with Duke yet, as they will play them in a rematch at Cameron Indoor Stadium Saturday January 20th at Durham, North Carolina. Note: Stallings said Ryan Luther did not get good news in his re-evaluation today. Said they’ll reconsider a medical redshirt.